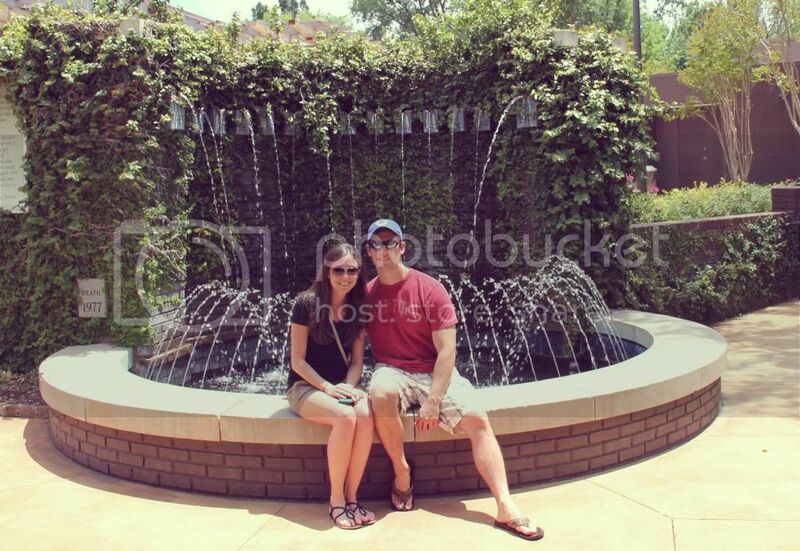 On Memorial Day, Jeremy and I ventured down to Tupelo, Mississippi. It's only about an hour away from us, and it's the town where Elvis Presley grew up. Elvis lived in this tiny town until he was thirteen years old and his family packed up their car and moved to Memphis, Tennessee. It was truly incredible to see how humble a beginning Elvis had and how this sleepy town shaped the man he was to become. 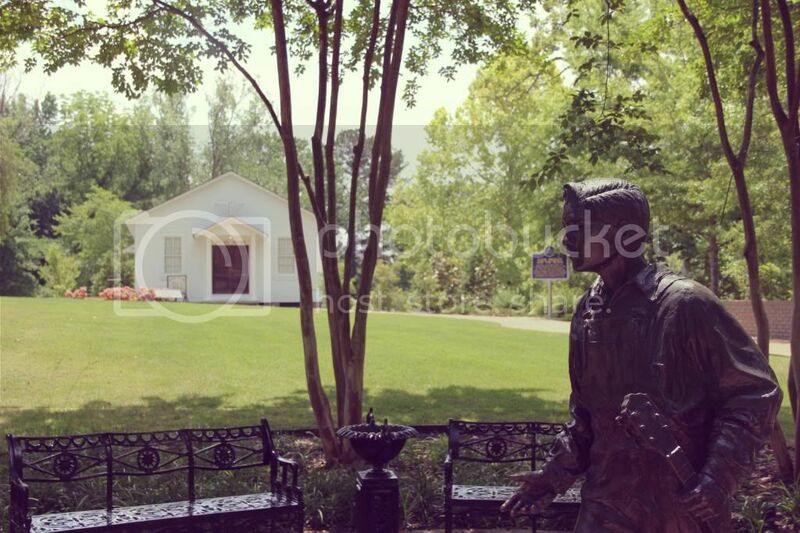 If you get the opportunity to visit Tupelo, I highly recommend visiting the Elvis Presley Birthplace and Museum. The house he was born in and lived in during part of his childhood is the main attraction. 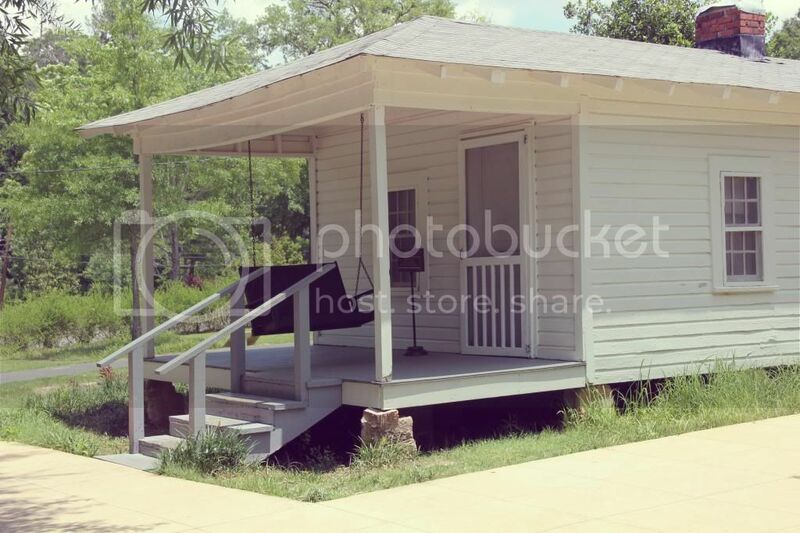 This tiny two room home (pictured above) is in the exact location it was in when Elvis lived there. Even though the furniture and things inside are not original to the Presley's, you really get a feel of what it must have been like, although I can't truly imagine living in a two roomed house. Notice that I said two rooms... not two bedrooms. 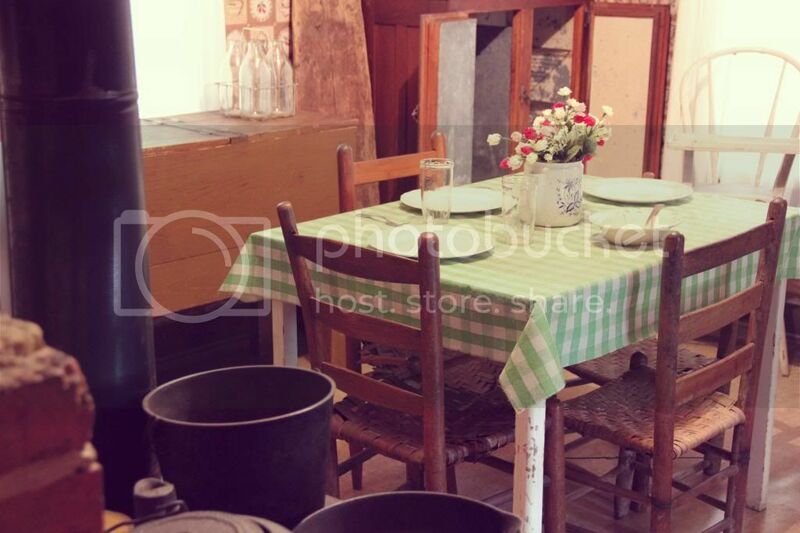 It is just a room that was a bedroom/living room and a kitchen... that's it. It's pretty crazy to think that when the Presley's moved, they sold all their furniture. Jeremy and I keep talking about how their furniture is sitting in someone's home or an antique shop or (we hate to say) has been destroyed, and nobody even knows that it all belonged to Elvis! 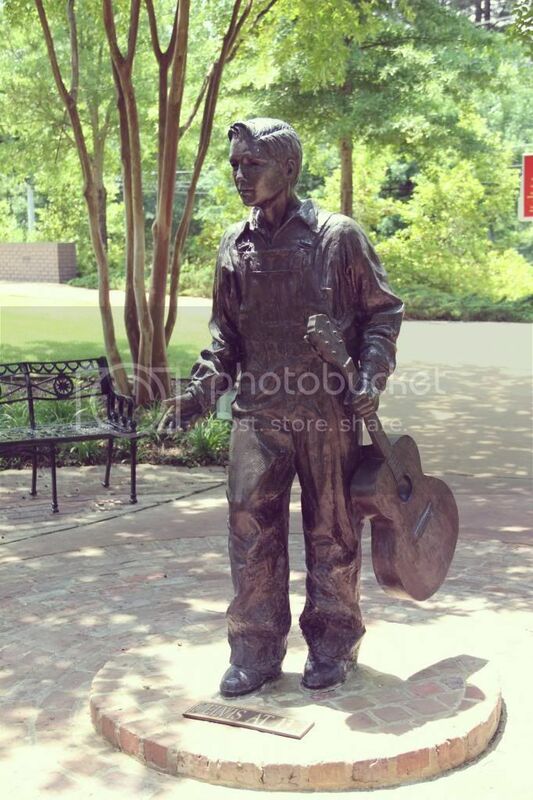 Beside the house, there is a statue depicting 13 year old Elvis holding his guitar. He was very friendly. 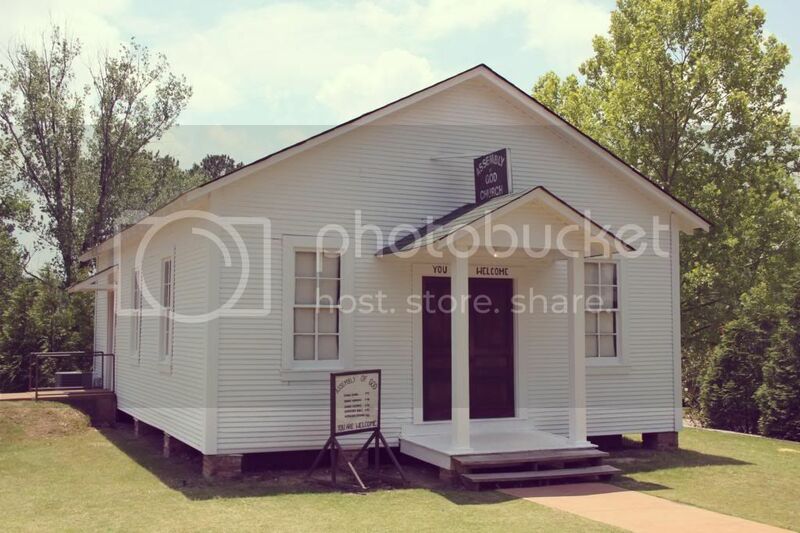 Also found on the grounds is the church Elvis attended while growing up. It was originally located a few blocks away, but they moved it to this location and restored it in 2008. You have the opportunity (if you buy an extra ticket) to go into the church and watch a presentation where they simulate what a church service would have been like when Elvis attended. It's actually a pretty cool thing to see. You sit down in the pews and screens come down from the two walls on your sides and a screen at the front. Then they play a video of actors going through a service. It's surrounding you so you feel like you're really there. They even have a little boy who pretends he's Elvis and sings a little song. It's pretty cute and very interesting! 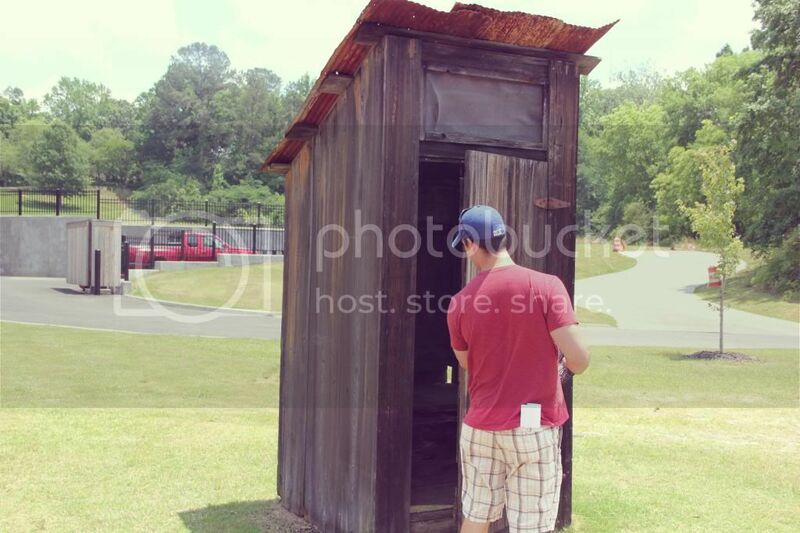 I'm not exactly sure why, but there was an outhouse on the grounds, too! There was no plaque or description or anything, but I imagine it was to show us what it was like to not have bathrooms like we have today.. Jeremy was a little scared to open the door and see what he would find. After we toured the grounds and the museum (sorry, pictures weren't allowed! 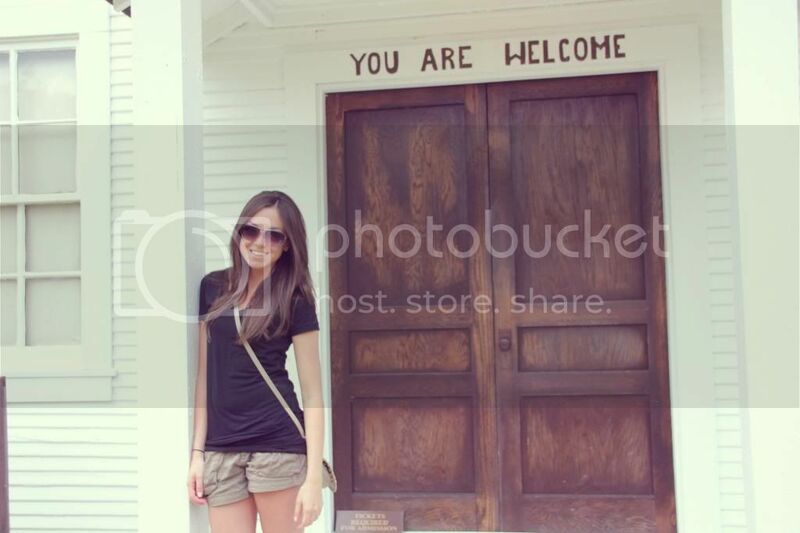 ), we took a little drive into the little town of Tupelo. Since it was a holiday, everything was pretty much closed but it is definitely the cutest little Southern town! 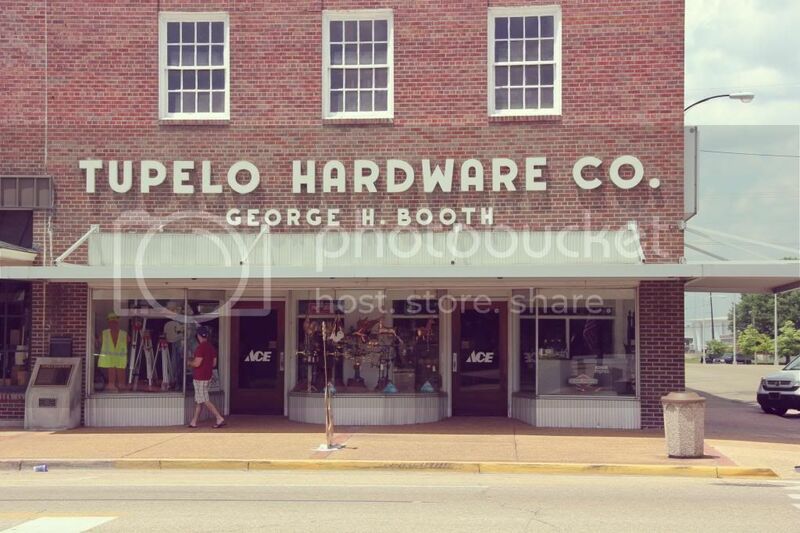 Tupelo Hardware is where Elvis purchased his first guitar. It's still there and still a working hardware store! 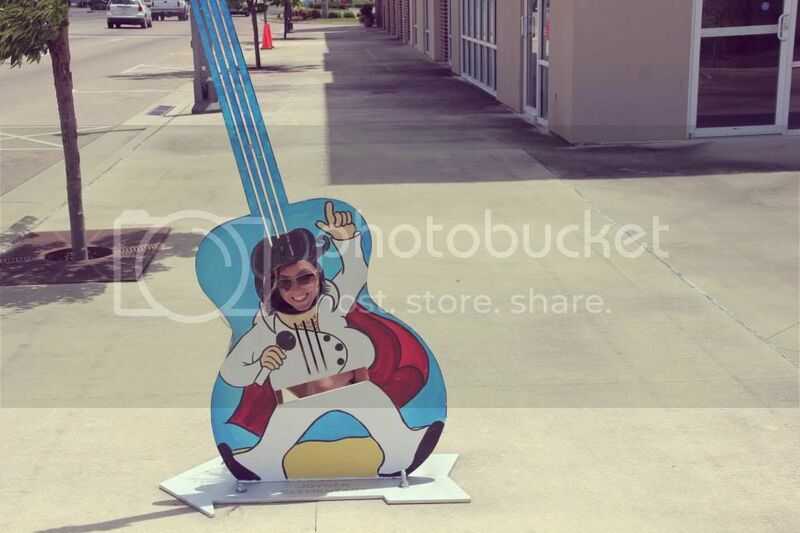 Apparently there's a little mark on the floor of the store showing where Elvis was standing when he was handed his first guitar. It is this cheesy stuff that we love!! I was sad the store was closed, oh well, maybe next time! It was the perfect little day trip! Just what I needed! This is so cool, I want to go! 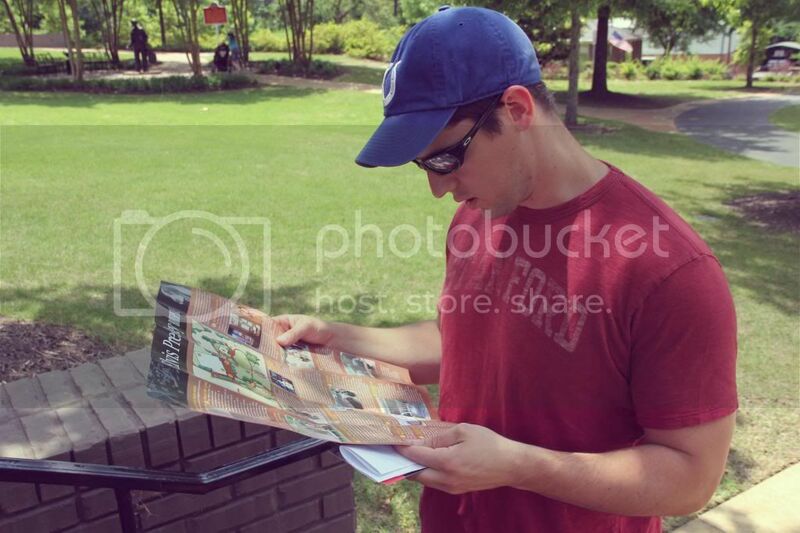 I went to Graceland 2 once. Would love to see the house + the church. Was it Baptist? Day trips are my favorite. I'm planning for a few in July when I have a few days off wth my husband! Looks like you guys had a great time. I'm always jealous of how pretty the weather looks in all of your pictures. In NJ it was 50 degree Tuesday and today it's 94! Looks so cool! Love the pictures!! 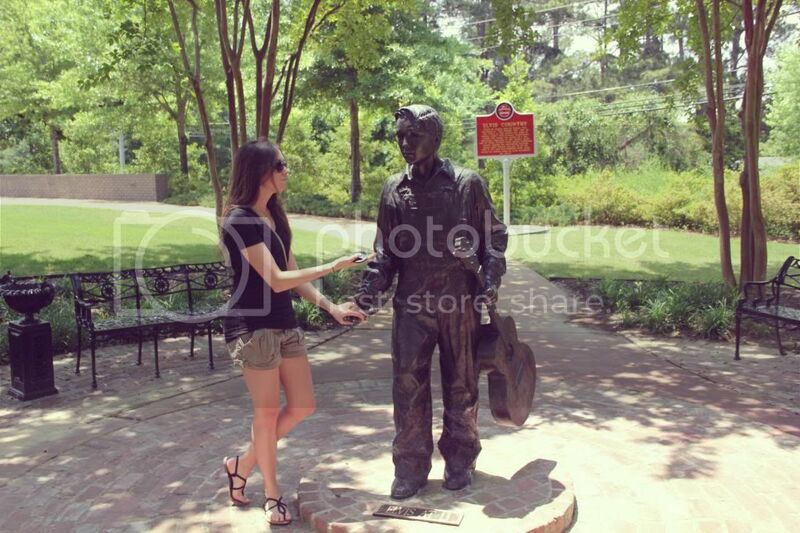 I love Tupelo! My parents live about 25 minutes away and we go all the time. I've never ever been to his old house but now you have made me want to go! What a fun little day trip! You look super cute, btw! My hometown (MUCH smaller than Tupelo) is pretty close to Tupelo. That's where we would always go to shop, out to eat, or to the movies! ha Glad y'all enjoyed your trip! This sounds like so much fun and I would love to visit one day! So interesting to see his very humble upbringing. Btw, thank you so much for stopping by my blog:)! Would you like to follow each other on GFC, Bloglovin, etc? 1. SO. COOL. Seriously, what a fun day trip! I wish we had cool things closer to us. 2. Where is your cute bag from!? I'm looking for something little! Wow that is SO interesting! I'll definitely have to visit sometime. Too cool!